A new chapter in Atlanta’s farm-to-table culinary community is poised to open by end of 2018 and you can help! 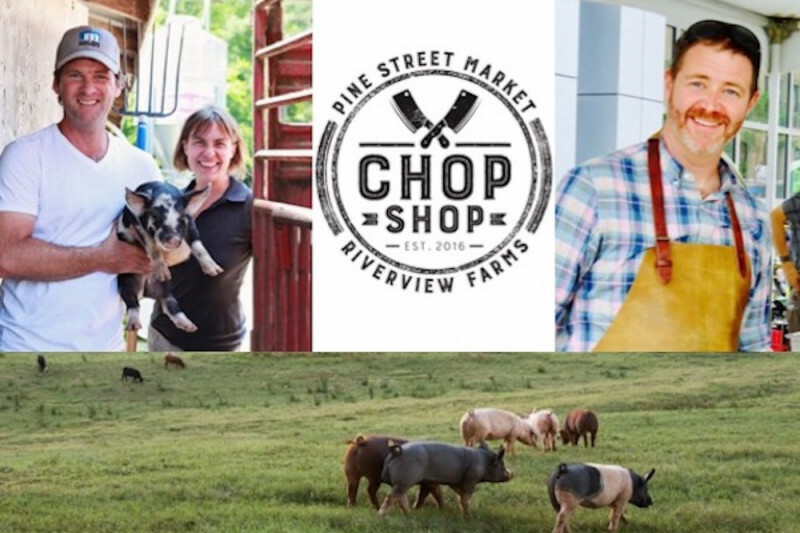 Chop Shop unites two of Atlanta’s local sustainable meat luminaries, Riverview Farms and Pine Street Market. Together they’re opening Chop Shop at 1366 Memorial Drive SE in Atlanta. The vision for Chop Shop is to serve as a beautiful oasis in the city to improve access to quality artisan meats, farm fresh produce, and heritage grains, complete with an expansive outdoor patio area defined by abundant container plants. The 1,500 square foot central paved area will be equipped with outdoor cooking equipment and tables to host cooking demonstrations, pop-up dinners, and local culinary and sustainable farming discussions. Events will emphasize the promotion of up-and-coming chefs, farmers, and food crafters to further expand and strengthen Atlanta’s exciting local food scene. Chop Shop is reaching out to the local food community – you! – to provide the contributions needed to realize the vision for the outdoor patio area. “We’ve worked hard to establish our infrastructure,” says Rusty Bowers, Pine Street Market’s owner and chief charcutier. Known for producing high-quality artisan meats including bacon, sausage, and coppa, Rusty has worked with Riverview Farms since he opened Pine Street Market in 2008. “A farmer-owned store is the logical next step – a little culinary, meat-driven mecca,” he says. Farmer Charlotte Swancy has had her eye on the Memorial corridor for some time. “Riverview has so many long-time relationships with customers, especially in the Grant Park area,” she says. 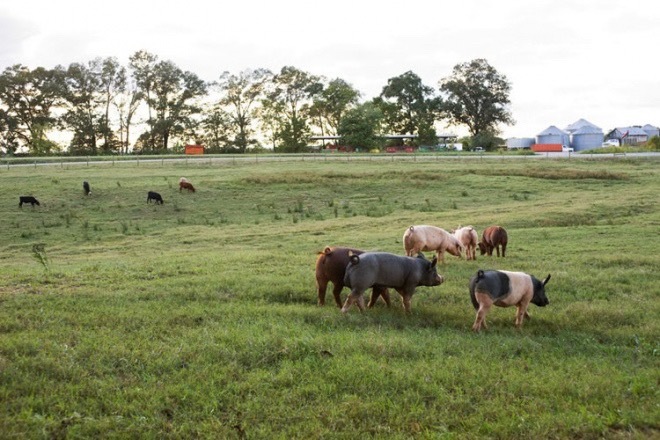 The farm, located one hour north of Atlanta, grows the heritage breed pork, grassfed beef, farm-ground heritage grains, and produce that have become staples available only at area farmers market or by pre-purchasing one of the farm’s subscriptions. “Opening a store to better serve our existing customers makes sense,” she adds. Get in on the ground floor by making a contribution before December 31st to get some cool swag! More importantly, you’ll be helping to lay another metaphorical brick in the foundation of a locally-sourced food system that continually drives our local economy and minimizes the distance that food travels from field to fork. Oh, and it tastes great, too. · $100 – Exclusive Chop Shop “Founding Member” t-shirt and periodic updates on the construction progress. Be the first to know what’s going on with the construction! · $500 – Two tickets to the store’s grand opening celebration and one of those cool “Founding Member” Chop Shop t-shirts and periodic updates on construction. 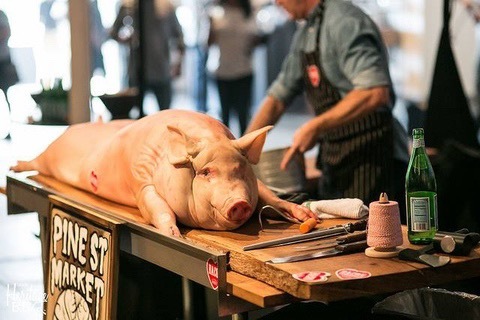 · $1000 – Be a “Butcher for a Day” at Pine Street Market. You’ll spend a day butchering side-by-side with the Pine Street team cutting steaks, pork chops, trimming bellies for bacon & more! Consider giving as a gift to that foodie you know and love. · $2000 – Private tour of Riverview Farms for 4. Visit the baby pigs, the grain grinding machine, the woods, the field, and the Coosawatee River that lends the farm its name. You will also leave with a basket of goodies from Riverview Farms and Pine Street Market. · $3000 – Develop your own Signature Sausage alongside Rusty, to be sold at Chop Shop. Your recipe, you name it, available on our shelves, as long as you keep it clean. · $3500 – Private cooking class for 12 on the Chop Shop event patio. Learn behind-the-scenes techniques from an up-and-coming Atlanta food crafter. Snack your way through this event while you learn. · $5000 – Host a private wine and charcuterie tasting event at Chop Shop for up to 25 people. * The fine print: Contributors at the above reward levels will receive a follow-up email from Rusty and Charlotte with details, specific to your reward level. Chop Shop Founding Members t-shirts will be available at Pine Street Market for pick up or to be shipped. The “Butcher for a Day” reward must be scheduled for a Tuesday or Wednesday in coordination with Rusty Bowers at Pine Street Market. The “Private tour of Riverview Farms” reward must be scheduled and coordinated with Charlotte Swancy of Riverview Farms. The “Develop your own Signature Sausage” reward will be scheduled and coordinated by Rusty Bowers at Pine Street Market. The “Private cooking class” and “Private wine and charcuterie tasting” will be scheduled after the Chop Shop Grand Opening and will be coordinated by Rusty Bowers and Charlotte Swancy.